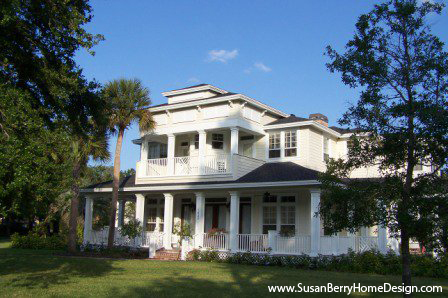 Custom home building design by Classical Home Design, Inc., Susan P. Berry in Winter Park, Florida for the Client, who bid the plans to several local builders. Key West in Olde Winter Park. Classical Home Design, Inc. designed this new custom home for a very large family. The home is situated on a corner lot that faces 2 brick streets. They love all the compliments they get when neighbors tell them that the home looks like it’s been there forever. The front porch opens to a central stair hall with a Home Office or Formal Parlor to the left and a Home School Music Room or Formal Dining Room to the right. Straight ahead is a large Family Room and open Kitchen. On the second floor, the center bay is a Jack and Jill bath with the two front bedrooms opening to the balcony. 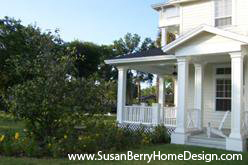 The wrap around porch leads to a covered porte-cochere by the kitchen door for unloading kids and groceries. The side porch leads to a family herb garden. The large family dining room is surrounded by windows facing the pool. Above it is the master suite. The family room opens to the ground floor porch. 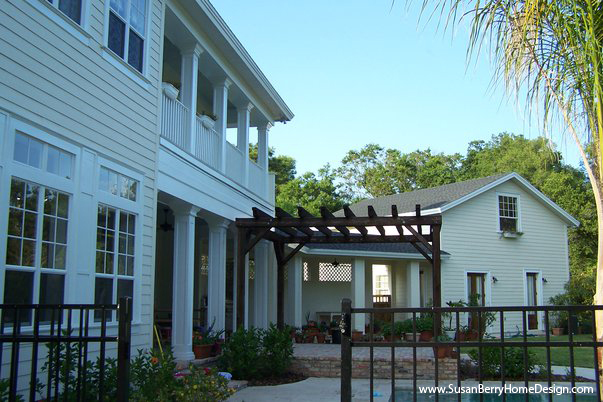 An open trellised seating area adds additional outdoor dining space. Three second floor bedrooms open to the balcony. The detached garage has an exercise room and the pool bath on the ground level, with a guest apartment above.